LOS ANGELES (AP) — Chris Brown has finally put his 2009 attack on Rihanna behind him, at least legally. 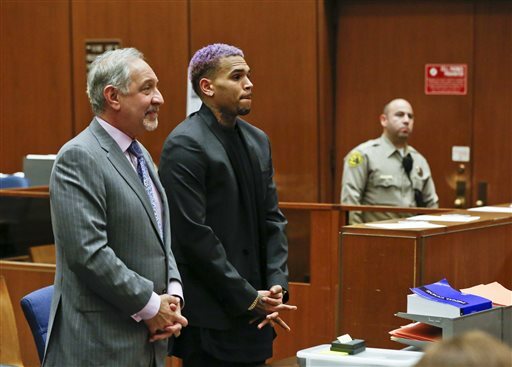 Superior Court Judge James R. Brandlin ended Brown’s felony probation on Friday March 20, 2015, more than six years after the R&B singer brutally attacked his then-girlfriend hours before the Grammy Awards. The attack erased Brown’s squeaky clean image, which he has failed to regain in the ensuing years after incidents such as throwing a chair through a window after a contentious “Good Morning America” interview and a parking lot brawl with singer Frank Ocean. Brown’s career has partially rebounded, with the singer performing at the 2012 Grammy Awards and winning a trophy for best R&B album. Brandlin’s decision marks the first time since mid-2009 that Brown will not be under the supervision of court or probation officials. The singer initially avoided problems with the case, but since 2013 has struggled to complete his community service obligations and had his probation revoked in January after he performed a show in Northern California without permission. “I couldn’t be more delighted,” Geragos said after the hearing. Later that year, Brown struck a man outside a Washington hotel and was charged with misdemeanor assault. Brown was ordered into rehab but was dismissed from the facility for violating its rules and spent two-and-a-half months in custody, with U.S. marshals shuttling him between Los Angeles and the nation’s capital for court hearings. In another incident while in treatment, Brown threw a brick at his mother’s car following a counseling session. The incidents occurred after Brown had completed court-ordered anger management sessions. Celebrity website TMZ posted a photo of Rihanna’s battered face, showing extensive injuries that a detective described in detail in a search warrant affidavit seeking phone records from both singers. Brown repeatedly punched Rihanna, bit her ear and choked her to the point that she nearly lost consciousness, according to the affidavit. Brown pleaded guilty to felony assault in June 2009 and was ordered to stay away from Rihanna, although the order was later lifted and the pair rekindled their romance. They’ve since broken up. Tags: Chris Brown, court, domestic violence, Grammy-Award Winning, Los Angeles, probation, R&B, Rihanna. Bookmark the permalink.